RLC T-SHIRTS FOR OUR 60TH ANNIVERSARY - We are ordering new RLC t-shirts in honor of our 60th Church Anniversary. Deadline is this Wednesday, April 10th! You can now place your order for RLC shirts online at the following link. LENT SOUP SUPPER - Last midweek Lent service is April 10th with soup supper starting at 6pm and concludes with the Holden Evening Prayer at 7 pm. Come join us. 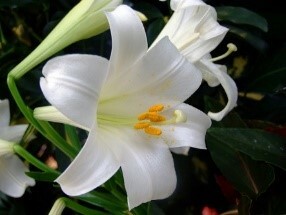 YMT PLANT SALE LAST DAY TODAY APRIL 7th – Fellowship hall. Please support our youth fundraiser and buy a plant for your home or give as a gift. COMMUNION INSTRUCTION CLASS THIS SATURDAY APRIL 13th - If your child is ready to receive communion instruction, class will be on APRIL 13th from 10:00-Noon. We ask that an adult stay with their child to help them follow along. Please sign your child up to be sure we have enough materials for all. COMMUNITY PALM SUNDAY SERVICE APRIL 14th at 6pm at Haysville Christian Church. TOMAH SHINGA REGISTRATION OPEN! Camp Tomah Shinga is excited to see returning campers and welcomes new campers at each session. Programs are for youth of all ages. Register at http://tomahshinga.com/summercamp. SANDWICH SATURDAY – APRIL 27th at 9:30am. CONFIRMATION DINNERS –Thank you for providing a meal. It is very much appreciated! Wonderful Palm Sunday Brunch! 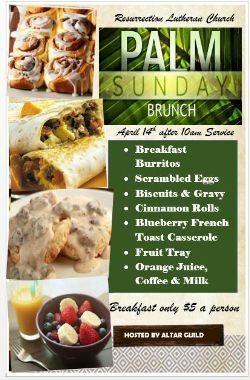 Have an appetite next Sunday after 10 am service.